Herringbone Quilts – they are modern, yet timeless. They are playful, versatile, and beautiful! So when a client reached out to us for a custom Herringbone Baby Quilt, we jumped at the opportunity. AND since we are in HRT (Half Rectangle Triangle) mode over here at LJQ (see last week’s post on Della’s Diamonds), we also decided to create a Herringbone Quilt Pattern. For this custom baby quilt order, our client wanted a baby quilt that was minimalist and featured a colorway of navy and grass green. The Herringbone Pattern was a perfect fit for the minimalist design. We paired white with the navy and green prints to create a beautiful baby boy quilt. For the fabrics, we chose three different Navy prints and three different Grass Green prints. We didn’t want to overpower the Herringbone pattern with a lot of patchwork. This quilt is all about peaceful simplicity. We used Karen Lewis’s Lib Stitches in Navy and Green, Cotton + Steel XOXO in Nightowl, and Kona in Blue Grass. All paired with Kona in White. The color palette is bright, cheerful, and elegant. The quilt backing and binding features Scrumptious Stripes in Navy. For the Herringbone Quilting, we stitched in the ditch of all the seams except for the seams running vertically. We then quilted ¼” on both sides of the ditch. The quilting accentuates the Herringbone Pattern perfectly. Our Herringbone Quilt Pattern features HRT’s (Half Rectangle Triangles). We’ve created quite a few HRT quilts! We love how versatile HRT’s are! Working with HRT’s does require some planning. Our Herringbone Quilt pattern walks you through the steps you need to take to create this stunning quilt pattern. Our pattern also offers cutting instructions for quilt sizes ranging from mini to queen. This Herringbone Quilt is on its way to its new owner and we can’t wait to see how it looks in the baby’s nursery. It will be a beautiful play mat and a comforting cover for this sweet little boy. As you can probably tell by now, we love making baby quilts! We love how they can be customized to each individual owner – no two baby quilts are alike! We do take custom quilt orders, so feel free to reach out to us if you’re interested in having a quilt made just for you. But if you would like to create a Herringbone Quilt on your own, download our pattern for detailed instructions. NOTE: You will need this Creative Grids Half Rectangle Triangle Ruler to cut your HRT’s. Have you made any HRT quilts? We’d love to hear all about them and your HRT tricks of the trade! Take care and we will see you soon! Previous PostDella’s Diamonds! 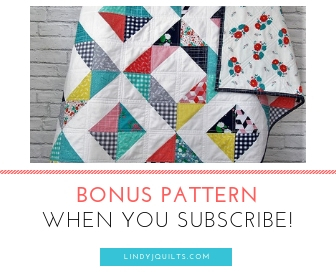 A New Lindy J Quilts Pattern Now Available! Next Post Auburn Baby Quilt – Beginner HRT’s – Pattern Available!